My first concern about this idea is different motion artifacts for different colors, if fast moving objects are photographed or in presence of camera shake. It might require a good deal of image processing to conceal these artifacts. The second concern is a more difficult wiring of the pixel array, which might result in lower fill factor - can be resolved, if made in BSI. 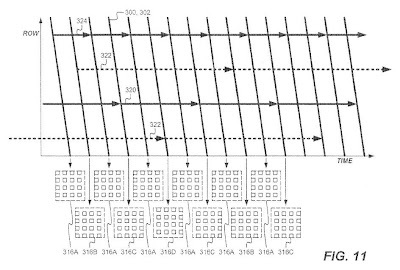 TSMC patent application US20090020838 proposes to use black photoresist rectangles between the neighboring pixels under color filter to reduce crosstalk. I don't think the idea is new, but there might be some new trick in the manufacturing process of the rectangles. Unfortunately, you teamed with the company that's now slipped to fifth. Should we still be expecting that camera phones are going to help us in the second half of the year? Camera phones – I'm going to tell you information that you have, from some of our colleagues, with which we have excellent relationships, not just with Motorola by the way. We have excellent relationship with Nokia, and many others. They are obviously projecting a difficult year, for next year. Obviously we're going to take that into account, as well as what is the right business plan for that business, at this time. But if you haven't been selling any of those, and you start selling some, it's incremental. We are very happy with that. The question is the level of investment. The whole question, here, is if the market is contracting and we don't have the 10% growth that we enjoy in the digital portfolio for more than a year, obviously we're not going to have the revenues, cash, and earnings that we had before. We are going to have less. We have to make sure that we realize that and peak where we are going to put that money. That's the exercise, portfolio management. What conclusion we can draw from this? Probably, no business unit is immune from cuts in this difficult time. Yahoo: Tessera’s OptiML Wafer-Level Camera (WLC) technology has won a 2008 Prism Award for technical innovation. The Prism Award is sponsored by SPIE and Laurin Publishing (Photonics Spectra, EuroPhotonics, BioPhotonics magazines). Business Week cites iSuppli reverse engineering of another cult phone of these days - BlackBerry Storm. The reverse engineering revealed that Storm uses Omnivision 3MP sensor. iSuppli estimates the AF-enabled camera module cost is $13. Electronic Design published a promotional article about Omnivision's OV5642 BSI SoC sensor. About the only new thing I was able to spot is that the sensor is sampling now, and expected to enter volume production this quarter. PR-Inside: Sarnoff announced the launch of "Camera Commander", a complete CMOS and CCD imaging device and camera testing system for camera manufacturers and their users. Camera Commander is the first imaging testing system compliant with the European Machine Vision Association (EMVA) 1288 standard, enabling it to provide internationally recognized test results. Camera Commander is comprised of a low-cost bundle that includes a computer, monitor, and software package for automated, high-speed inspection and analysis to assess product quality and to evaluate the appropriate component fit for a target application. Typically the test time of Camera Commander is less than 5 minutes per camera. Business Wire: Dr. Homayoon Haddad, previously Vice President of Advanced Sensor & Pixel Development for MagnaChip Semiconductor, has joined SiOnyx as Vice President of Device Engineering. Prior to MagnaChip, Dr. Haddad spent more than 20 years at Hewlett Packard and Agilent where he held a variety of technology management and engineering roles. The Engineer On-Line: London, UK based Dexela is developing the mammography system with X-ray detector based on an array of tiled CMOS sensors. "It will be the largest CMOS image sensor ever commercially deployed," Dexela founder Edward Bullard said, adding that his company plans to demonstrate a prototype this summer. It will be low noise and take images 30 times faster than competing amorphous silicon flat-panel detectors. So far, Dexela has raised more than £4.7m via two funding rounds and grants - looks like the image sensor development is cheap these days, even the world largest ones. Yahoo: Tessera’s SHELLCASE wafer-level chip-scale packaging technology has shipped in more than one billion image sensors. I believe the vast majority of those are Omnivision sensors. ST Micro application US20090014764 talks about improving BSI sensor crosstalk. To achieve this, ST goes beyond silicon and uses SiGe alloy in the photodiodes to improve red light absorption, thus reduce the layer thickness and so reduce the crosstalk, mostly in green and blue. Having very thin photosensitive layer also opens other isolation possibilities, such as oxide-filled shallow trenches. Aptina application US20090017573 proposes a dual or triple Vth transistor in the pixel source follower to modify its sub-threshold behavior and extend the output voltage swing. The extension is not large and does not justify the additional Vth adjust mask, in my opinion. But if just a combination of existing masks is used, it might be worth considering. Siliconfile application US20090014761 proposes to extend the photodiode under field oxide region to improve fill factor. This idea has a lot of prior art from Aptina, Sony, Omnivision and many others. I don't think it would be granted. EETimes: Sharp introduces 1.3MP CCD for security applications. The new RJ33J3AA0DT CCD can capture 22fps in full resolution. In the 4 pixel mixing VGA mode, the speed is 30fps. Its sensitivity is 400mV and smear factor is -105 dB. Samples of the new RJ33J3AA0DT are available now. No production date is given. Digitimes reports that image sensor makers see an improving demand for VGA and 1.3MP sensors for low-end "traditional" notebooks, mostly from Dell and HP. However, Digitimes sources do not see orders increase for more fashionable nEtbooks. Yahoo: Fairchild Imaging will be exhibiting CMOS image sensor technology for demanding low-light applications requiring high-resolution, high-speed and extreme sensitivity at Photonics West in San Jose, January 27 - 29. According to Colin Earle, Fairchild Imaging's Vice President of Sales and Marketing, "the new CIS technology represents a dramatic breakthrough in low-light imaging. These new CMOS devices outperform the best CCD imagers. Moreover, the inherently digital, solid-state nature of CIS offers significant advantages over traditional low-light imaging devices such as image intensifier tubes or electron-bombarded sensors." Yahoo: Even though no information has been officially released, Next Inning Technology Research thinks there is evidence suggesting that Omnivision got a strategic design win in the Palm Pre. Pre has 3MP camera. If this rumor is correct, it means that Omnivision got quite a high profile design win for its high-megapixel sensors. C.Tisse, H.P. Nguyen, R.Tessieres, M.Pyanet & F.Guichard, “ Extended Depth-of-Field (EDoF) using sharpness transport across colour channels”, Proc. of SPIE conference on Optics+Photonics (Optical Engineering and Applications), San Diego, US, August 2008. F.Guichard, C.Tisse & F.Cao, “ Image Processing Challenges in the World of Small Pixels”, Talk / Pre-conference Workshop - Proc. of IntertechPira conference on Image Sensors, London, UK, March 2008. The papers present the new interesting approaches to small pixel image quality improvement. Scalado proudly announces that its CAPS imaging Software Development Kit is now being used in more than 300 million mobile phone handsets, compared with 150 million at this time last year. During this same 12 month period, Scalado has also doubled both its revenue and its total number of staff, thanks to its ongoing expansion in both Europe and Asia. Vision Systems Design: Imatest and Aptina have partnered to deliver an integrated software system for automatic testing of CMOS sensor image quality and subsequent reconfiguration of image sensor settings. According to the companies, DevWare-enabled Imatest loads images directly from Aptina's image sensor configuration software, DevWare. Images are then automatically analyzed across various digital image quality factors, providing product engineers with the information required to re-set sensor settings. I am happy to inform you about the fact that the organizing committee of the International Image Sensor Workshop 2009 is working on a special Symposium focusing on Back-Side Illumation of Solid-State Image Sensors. This symposium is scheduled on the first day of the workshop, being Thursday June 25th, 2009. We invited 8 world experts in the field of BSI. At this moment 4 of them already confirmed that they will give a talk at the symposium. We are convinced that this new initiative will be a great success because the BSI is a very "hot" topic. 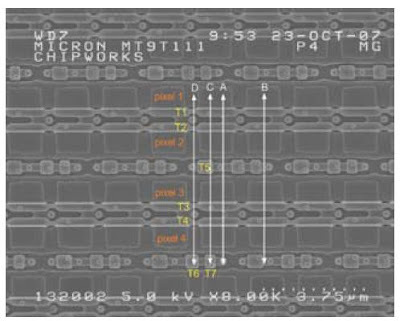 For professional applications as well as consumer applications, for CCDs as well as CMOS, engineers are researching the possibility to produce back-side illuminated image sensors. On the other hand, I would like to take this opportunity to [remind] you about the fact that the deadline for paper submissions is within 6 weeks from now, being Feb. 26th, 2009. If you have in mind to submit an abstract, make sure you do not miss this deadline ! Looking forward to a successful IISW 2009 ! Albert Theuwissen, on behalf of the organizing committee. This sounds like a great idea to me. BSI is going to be the next great thing and such an open discussion can help the industry to overcome the initial problems. "...if light is detected in the photodiodes, electron-hole pairs (EHP) are generated and accumulated. The accumulated electron-hole pairs are transferred to the floating diffusion region via the transfer transistor. As a result, the potential in the floating diffusion region is changed, and the active pixel sensor detects and outputs the change in potential." The application mostly talks about process ideas. I have seen that process engineers sometimes do not understand the intimate details of pixel operation, so it's somewhat excusable. Still, it's quite rare to see such a glaring mistake in an official document from one of the leading image sensor companies. The anti-reflection films are said to include "at least one of polysilicon, amorphous silicon, tungsten, and TiN". On the negative side, if these films are conductive, they can significantly increase pixel parasitic capacitances. info4security shows promotional Pixim video comparing its HDR technology with regular CCD - a lot of side by side pictures. Update: Here is the direct link to YouTube video. Digitimes reports that TSMC has recently received rush orders from Omnivision. University of Wisconsin-Madison, The Register and Science Daily report that Associate Professor Zhenqiang (Jack) Ma and colleagues have developed a flexible light-sensitive material. Their technology is featured on the cover of the January 5 issue of Applied Physics Letters. Ma and his group can create curved photodetectors with specially fabricated nanomembranes—extremely thin, flexible sheets of germanium. Researchers then can apply the nanomembranes to any polymer substrate, such as a thin, flexible piece of plastic. Currently, the group has demonstrated photodetectors curved in one direction, but Ma hopes next to develop hemispherical sensors. Ma's curved photodetector could eliminate that distortion. "If you can make a curved imaging plane, you just need one lens," says Ma. "That's why this development is extremely important." Micron has published its 10-Q report telling that Aptina's quarterly income was $3M on sales $180M versus $9M loss on $169M sales a year ago. Gross margin on imaging products improved to 29% from 28% a year ago. The final program is much bigger and even more interesting than its preliminary version. It seems to retain its educative and marketing tint and probably becomes the best image sensor conference of this sort. Yahoo: Omnivision introduced OV7740, the sensor for notebook webcams. The VGA sensor is based on 4.2um pixel having 6800mV/lux-sec sensitivity. The OV7740 is capable of operating at 60fps in VGA resolution and 120fps in QVGA. The OV7740 is immediately available for sampling with volume production slated within the first quarter of 2009. Techno Systems Research projects the notebook webcam market to exceed $6 billion by 2012, as demand for portable PCs continues to grow. 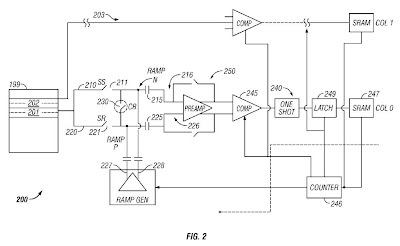 Omnivision patent application US20090002528 describes the split photodiode HDR sensor that Chipworks showed us a month ago. Indeed, as written in comments, the read curtains of the two photodiodes are aligned. The short-exposed photodiode also acts as anti-blooming drains for excess charge overflowing from the long exposure time photodiodes. The photodiodes are arranged in such a way that long exposure time photodiodes are neighbored along vertical and horizontal directions by short exposure time photodiodes, so that the blooming protection is more efficient. Looks like a very nice idea, but blooming during the short exposure portion might still be a problem. While we are at HDR issues, TI proposes an improved way to mix two differently exposed images in its application US20090002530. To cope with mismatches and noise, TI employs linear regression and adaptive filter for noise gap reduction between high-gain and low-gain outputs of an HDR sensor. Application US20090001257 from unknown Korean company (looks like Samsung to me) proposes to align the microlens with the active area, rather than the top metal. Normally in the process each subsequent layer is aligned with the previous one, so as third metal is aligned to second metal, which is aligned to the first one, which is aligned to poly or active. So, the misalignment is accumulated over many layers, increasing optical path variations. Being able to align microlens to active is an obvious idea, but to the best of my knowledge, this is impossible with any meaningful accuracy. Unfortunately, the application does not describe how exactly the stepper should be modified to achieve this alignment. I'm unable to find what company filed this application, but if somebody is able to align microlens straight with active layer, it would be a tangible advantage. Dongbu application US20090004770 looks like a process engineer report on 400-450C final annealing influence on dark current non-uniformity and metal sheet resistance - a lot of low-temp annealing comparison data with some analysis. The experimental data is based on what looks like Foveon X3 sensor with 3.3um pixels made in 0.18um 1-poly 5-metal process. I'm not sure it's worth a patent, but it's certainly an interesting read for those who learn to deal with pixel optimizations. The positive gate bias has an advantage of better blooming suppression, while the negative bias does not cause full well degradation. I doubt that this patent would be granted in its broad form. 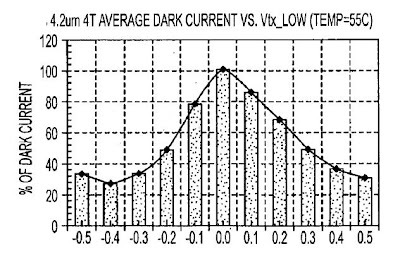 Many companies for years use negative transfer gate bias exactly for the purpose of dark current reduction. Some use positive bias for different purposes too. But the application has an extension - a circuit which changes the bias depending on light conditions - this portion has chances to become a patent. It looks like Sony leads the race to get BSI sensors into production. Just announced Sony 2009 camcorder lineup features Back-illuminated Exmor-R sensor. Sonystyle also has a video on the new sensors. Sony says that its BSI sensor provides approximately 2x increase in sensitivity compared with conventional models. However, InfoSync observed just 50% improvement in brightness and exposure comparing BSI-based HDR-XR520V with conventional HDR-SR12. It's hard to say what is the pixel size in the new sensor. HDR-XR520V camcorder featuring 1/3.15" Exmor-R sensor has 12.1MP stills resolution, which corresponds to 1.1um pixels, if no tricks are used. Most probably, Sony interpolates the its 45-deg angled ClearVid sensor by a factor of 2, meaning that the physical pixel size is close to 1.6-1.7um or so. The HDR-XR520V and HDR-XR500V camcorders with BSI sensor will begin shipping in March 2009. Update: Camcorderinfo.com reports that the actual pixel count of HDR-XR520V sensor is 6.6MP, which means that my pixel size estimations of 1.6-1.7um are correct. Ambarella announced the availability of the A5 SoC platform for hybrid cameras. The A5 family consists of three products: A530, A550 and A570. Each is available with a full reference design. The A530 integrated circuit can capture 10 MP still pictures while generating and compressing high-definition video in both 720p60 and 1080p30 formats. The A550 in addition supports the standard HD broadcast format 1080i60. The A570 captures as many as 5.3 MP at 60 frames per second. This allows full HD video recording while concurrently storing 5.3 MP still images (16:9 aspect ratio) without interrupting the video recording. The A5 platform is available now in sampling quantities. EETimes: FBR Capital Markets predicts that utilization rates at TSMC could decline to below 40 percent in 1Q '09. Omnivision is named among the companies making the biggest order cuts. I wonder how long the battery lasts with all these nice features activated. The differential approach is said to enable a more consistent switching point, allowing the amplifier to be linear over a larger part of its range. It's probably true, but at the expense of added area and power consumption. Also, the PREAMP block should have an wide common mode range and good high-frequency common mode rejection, which might increase power even more. Altasens' application US20080316342 looks quite obvious to me. It talks about gain control with fine steps. The gain control is split between analog and digital. The analog gain provides coarse gain steps and the digital gain provide finer gain steps between adjacent coarse analog gain values. Since analog gain can suffer from low precision, on-chip calibration is implemented to calibrate the analog and digital gain. If granted, it would become quite broad and strong patent, but to me it seems obvious and I think there would be some prior art, even though I can not point to it specifically. SPIE: Aptina has developed a softcopy ruler method to measure image quality. It enables the calibrated visual assessment of image quality. Because the assessments are measured in just noticeable difference (JND) units, it is possible to combine measurements of different attributes and predict overall quality. The method was developed during phase 2 of the Camera Phone Image Quality Initiative sponsored by the International Imaging Industry Association (I3A). Trading Markets: Shanghai, China-headquartered fabless semiconductor company Chipnuts has sold its mobile phone software platform business to Aptina Imaging. How much Aptina paid for the newly-acquired unit is unknown, according to an employee for the Shanghai company, adding that the buyer will probably get the 30-40 Chipnuts employees at the unit. Samsung Semiconductor has opened two R&D centers in California for advanced image sensor technology to expand the R&D activity of its Semiconductor R&D Center and Systems LSI Business Unit in South Korea. One center, associated with Systems LSI (Image Sensor Products Group) will be located in San Jose and focus on next-next generation technology. The second, associated with the Semiconductor R&D Center will be located in Pasadena, not far from Caltech and JPL, and will be looking at imaging technologies for more future application. Dr. Eric R. Fossum will be directing the R&D activities in the 3 locations and is now looking to hire from the best and brightest at all levels to staff the R&D activities. Disciplines of interest include advanced imaging algorithms and ISP design, deep sub-micron device physics, optics, device simulation, pixel design and layout, and device and test chip electro-optical characterization. Congratulations to Eric with the promotion and good luck with this new assignment! My only concern is that Eric might not have a time to organize the sensor community events now. Awaiba, the custom sensor design house, has come with its own branded high speed line sensors. The sensors are oriented to machine vision market with pixel sizes ranging from 3.5um to 500um. The company's main business remains the development of custom specific CMOS image sensors which are not available on the market, while the standard products are just a byproduct of its core activity. Embedded.com published Tensilica article describing HD video processing pipeline and benchmarks - a marketing-level educational article. BBC News reports that UK Engineering & Physical Sciences Research Council granted £489,234 to the team led by University of Glasgow for work on image sensor improvement. The article is mostly based on University of Glasgow news published just over a month ago. It's hard to understand what exactly is going to be developed. The project will take advantage of a phenomenon called plasmon resonance in their efforts to create an imager that will produce sharper, more colourful images. Plasmon resonance refers to an interaction produced when light waves fall on a metal surface, or in this case, the thin metal film used on CMOS image sensors. When light shines on the metal film, electrons on the surface absorb the energy of the light waves and begin oscillating, or shaking, in groups. The resultant combined waves are called plasmons and they modify the light distribution around the metal. The metal nanostructure is claimed to increase the sensitivity of the CMOS image sensor and result in higher-quality images. The structures will enable the plasmon resonators to be ‘tuned’ into the same frequency as various colours of light, thereby improving color discrimination in images. This could offer a cheaper way of filtering different colors of light, reducing the current number of processes currently used to distinguish between different colors. To me this work sounds like a search for a substitute for color filter and, may be, microlens. Update: The Herald also runs an article clearly stating that the technology is intended to substitute or improve color filters.